What's the best way to give my pet medication? How should I store the medication? Some medications require refrigeration or room temperature storage to be effective. Certain meds may be light sensitive and should be stored in a dark bottle. (HINT: if your pet's tablet medication is dispensed in a blister pack or came with a desiccant, then the drug is sensitive to moisture and each dose needs to be kept in the package until used). Am I allowed to give the medication with food? Some drugs are better absorbed into your pet's system when they are given with food while others need to be given on an empty stomach for best effect. If the medication needs to be given with food, pets with certain conditions such as food allergies or pancreatitis may have restrictions on what type of food can be used for administration. (HINT: pain relievers, anti-inflammatories, and antibiotics generally should be given with some food to help avoid stomach upset). Have I made my veterinarian aware of all the medications my pet is currently taking and do I understand what side effects of these medications to watch for? If your pet is taking multiple medications (including over-the-counter drugs or supplements) be sure to notify your veterinarian so they can help you avoid drug interactions and minimize side effects. If you are not sure about the answers to the questions above, then PLEASE call your veterinarian!! If you think your pet is experiencing a side effect, then PLEASE call your veterinarian!! It can be tempting to just "google it", but the internet is NOT aware of your specific pet's needs or medical history. Please do not adjust dosages, add additional medications, share prescriptions between pets, or abruptly discontinue medications without speaking to your veterinarian, unless you have been instructed to do so. Altering meds on your own can have devastating consequences such as increased side effects, organ damage, and re-emergence of worse disease. (HINT: abruptly discontinuing many seizure, heart, or behavior medications will cause a rebound worsening of the original problem. Stopping steroid drugs suddenly can cause vomiting, diarrhea, or Addison's disease. Even changing brands of medication within the same drug class may require a "wash out" period. Giving antibiotic medications (especially ear drops) sporadically can cause bacterial resistance and more aggressive future infections). Remember that pets are NOT little humans and Cats are NOT small dogs. This might also seem silly, but it is important to remember that different species handle medications differently. Giving a dog a child's dose of medication can still be toxic even though you just gave "a little bit". Many human and dog medications are unsafe for cats regardless of the dosage. Better to be safe than sorry- talk to your veterinarian if you have questions! Be ready! Before you get started, make sure you have everything you need within easy reach- meds, syringes, towels, pill poppers, treats, etc. Line up a buddy in advance if you feel like you might need an extra hand. Be realistic! There may be different forms of medication that are better suited to your abilities, pet temperament, and schedule. For example, if you know your busy schedule will make it hard to give a two to three time a day medication, check with your vet to see if there is a once daily option. If your pet is difficult to give oral meds to, ask your veterinarian about injectable or transdermal gel options. These alternatives might be more costly, but your pet won't get better without taking his/her medicine as intended. Be optimistic! The goal is to make this as enjoyable of an experience for your pet as possible. Don't forget to use a calm, soothing voice to praise your pet for doing well. Treats, if allowed, can be very helpful too. Don't take for granted that pets are very good at reading our body language- if you dread this experience, your pet can see it in your face and tone of voice and will be more stressed. Put your best face forward! Don't be shy! Don't be afraid to ask your veterinary clinic staff to demonstrate giving meds if you don't feel comfortable doing it solo the first time. If your veterinarian approves and your pet does not have any dietary restrictions, most medications can be administered by hiding it in food. Giving drugs right before a meal (when you know your pet will be hungry) often works best. You may need to offer a bite or two of food, then the hidden medication, and quickly follow up with more food. Generally, small amounts of canned food, small piece of low fat cheese, or teaspoon of peanut butter work well. (HINT: avoid "sugar free" peanut butter that contains the artificial sweetener xylitol as this can be toxic). If your pet is on a prescription diet or has food allergies- ask your vet for what foods are appropriate. Some pills can be crushed or dissolved in order to better hide in food, chicken broth, or tuna juice from the can. Ask your vet for advice first, though, as crushing some meds (like tramadol or some antibiotics) may increase the bitter flavor. If mixing in food, then make sure that your pet eats the entire portion in one sitting. Step 1: Holding Still. Place large dogs with their rear against a wall so that they cannot back away from you. Smaller dogs and cats may do well being held in someone's arms or placed on a tabletop at a comfortable height. (HINT: If you are holding a small pet, be sure to tuck them securely under your arm in a "football hold". To protect yourself from a cat's claws try wrapping their body in a blanket or large towel in a "burrito wrap" with their head poking out. If a table is not handy, your washing machine or clothes dryer that are not in use also work well). Step 2: Getting into Position. Hold the pill between your thumb and index finger of your dominant hand. Using your other hand, grasp your dog's muzzle firmly behind the canine teeth with your thumb on one side of the muzzle and your fingers on the other. In cats, you will grasp the head in the same fashion, gripping with your fingers around the cheekbones. Tilt your pet's head back so that he is looking up at the ceiling- your pet's lower jaw will automatically drop open a bit. You may use a finger from your dominant hand to push the bottom jaw open further. Example of the "burrito wrap"
Step 3: Down the Hatch. Quickly place the pill as far back in your pet's mouth as possible. If you don't get the pill over the hump on the tongue, they will often be able to spit it out. Hold your pet's mouth closed and lower his head into a normal position until he swallows. (HINT: gently rubbing your pet's throat or blowing in their nose helps to stimulate the swallow response. Having a syringe full of water handy to follow the pill with water will also help swallowing). If you feel uncomfortable sticking your fingers in your pet's mouth ask the staff for a demonstration or a "pill popper". 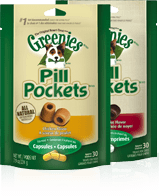 Pill pockets are a convenient moldable treat available for dogs and cats. "Pill poppers" help avoid putting fingers directly into a pet's mouth. The pill is loaded into the soft rubber end and "popped" into the mouth using the long tube and plunger. This version of a "pill popper" can be pre-filled with a small amount of water to help encourage swallowing after the plunger is depressed. Positioning pets to administer liquid medications is very similar to giving pills. Some liquids are flavored or can be flavored by compounding pharmacists to make administration easier. Pull up the proper amount of medication in the syringe before getting your pet positioned. Tilt your pet's head upward toward the ceiling and slowly squirt the medication into the side of the mouth. Be careful not to depress the plunger faster than your pet can comfortably swallow. There can be restrictions on how many milligrams of drug can be delivered this way. For example, the small ear flap of a cat can only provide enough surface area for roughly 0.2 milliliters of medication per dose and only a certain amount of drug milligrams can be contained in that volume. While the drug is absorbed through the skin, a residue of the drug carrier may build up at the application site and must be cleaned off before the next dose can be applied. Remember that if the drug can be absorbed through your pet's skin, then it will go through your skin too! (HINT: be sure to wash your hands thoroughly after application of transdermal gels and ask your pharmacist for finger cots to prevent accidental exposure). Transdermal gels often come preloaded in syringes. Measure out your dosage carefully and use a finger cot (pictured) to prevent accidental human exposure. Transdermal gels are applied to the interior hairless side of the ear flap. It is especially important to have your pet holding still when administering eye medications in order to prevent further eye damage. Make sure that you and your pet are in a comfortable position when you begin: for large dogs, situate their rear end against a wall so that they can't back away from you. Small pets are often best immobilized by wrapping in a towel. Wash your hands thoroughly first- it is important the tip of your medication bottle or tube remains clean to prevent further eye infection. Remove the cap to the ointment tube or dropper bottle and place it on a clean surface. To prevent contamination, avoid touching the inside of the cap or the tip of the tube or dropper bottle with your fingers. Put one hand under and around your pet's chin and tilt her head back so that she is looking at the ceiling. Use your dominant hand to hold the tube or dropper bottle and rest this hand on your pet's head so that if she moves your hand moves with her. It is very important not to touch the surface of the eye with the end of the tube or dropper bottle! Apply the medication directly to the surface of the eye. As your pet blinks, the medication will be spread over the entire surface of the eye and underneath the eyelids. - An alternative method for ointment medication is to apply the medication to your clean index finger and swipe the ointment quickly into the eye (HINT: during your swipe, aim for the corner of the eye closest to the nose and wipe outward). Unlike the human ear canal, a dog or cat ear canal is "L" shaped. The shape is important because ear mites, bacterial infection, yeast infection, foreign bodies, and tumors can be present deep within the ear and out of sight. At the bottom of the ear canal lies the delicate ear drum tissue that separates the ear canal from the inner ear. Please see your veterinarian for a diagnosis before applying medication or other solutions into the ear. It is important to know whether the ear drum is intact or ruptured, otherwise the solution used may damage your pet's hearing further. Ask your veterinarian for specific instructions on using your pet's prescribed medication. Some care plans will require you to clean out the ear canals in between medication applications while cleaning is to be avoided in other situations. Generally speaking, ear drops are instilled by gently lifting the ear flap straight up and placing the drops in to the ear canal which angles slightly toward the nose. After application, gently rub the base of the pet's ear to help distribute the medication into the deeper canal.